Students of the Faith of the Pure Ray understand that each of the world's seven major religions plays a favorite power game, and as we turn our focus to Judaism, we must address the game of Envy, which leads to genocides. 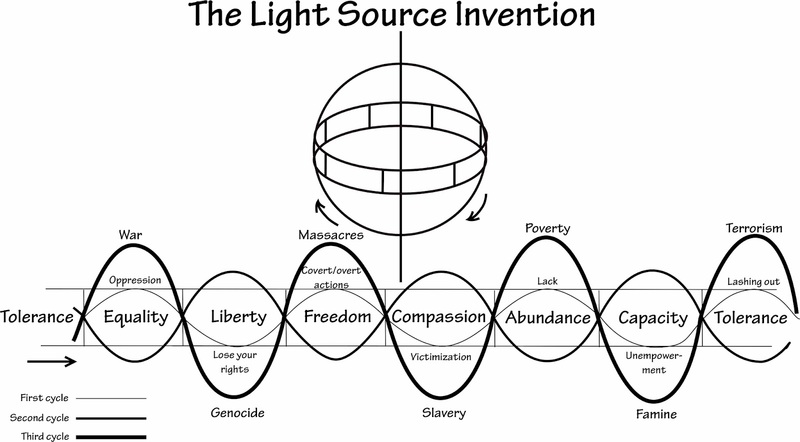 The Light Source Invention demonstrates that in a conflict, if one side is deemed more important than another, and the principle of equality is lacking, it sets the stage for a genocide based on a sense of judgment. People who have been dragged into a genocide lack liberty--their unalienable rights-- and by standing on the principles of Liberty, the swinging pendulum returns to the midpoint. If our unalienable rights are not reinstated, the conflict devolves into massacres from covert and overt actions. Our unalienable rights are granted to us by our Creator, and they are to be able to create the life we want without interference, to be treated fairly and equally, and to have a voice in our government. These rights are granted to us because they are necessary to be able to fulfill our purposes in life. People all over the world are being denied these rights, but coming to us from our Creator means that those who are denying them are breaking Universal Law. They are fighting the Universe, and they cannot win. "God does not work with anyone who is not standing on the principles of Universal Law." Our organization has been working to purify the U.S. legal system. Over the years laws and practices have been introduced that create chaos, and before our Constitution can be used as the basis for the international government, these laws and practices must be purified to prevent the chaos from spreading onto the international level. We have been working to overcome a misunderstanding that seems to allow people to justify denying others their unalienable rights. There are three levels of the Universe--the Principles, the Power and the Project, or in the case of our legal system, Universal law, Constitutional law and federal law, but many people see only Constitutional Law and federal law--the Power and the Project--and so they can "legally" justify playing the power games. The Iraq War devolved as a character defamation campaign against Saddam Hussein. Character defamation is an individual form of genocide. Many people around the world stood in protest, but because of the misunderstanding about the three levels of the Universe, many people in our government believe it is a legal war. This same misunderstanding is occurring all over the world. Misunderstandings progress in a cyclical process. We each have in our heart the blueprint for our perfect life, and each choice we make is supposed to help us reach our goal, but misunderstandings occur and kick us off course. After several events, we are 180 degrees from where we think we are, and all the time we believe we are headed toward our goal. This is the point of the Brick Wall, where we have reached a door, and all we have to do is to reach forward and turn the knob, and our perfect life is there. When we open the door, we don't see our dream life, but a brick wall. What we want is behind us, not behind the door. For George W. Bush, the preemptive strike should have led to an easy win, like the Gulf War, but it was in no one's best interest for the United States to invade Iraq. There were no WMD found, and the judgment against Saddam Hussein backlashed on George W. Bush and Tony Blair. Under Universal Law, what you do to another will be done to you. By denying others their unalienable rights, you lose your own, and this is what is occurring now within the United States. Now, to get them back, we must guarantee them to every person on the planet. The Contingency for our Exit Strategy for Iraq proposal is that Americans amend our Constitution to create the additional layer of government. This occurs with every power game. They seem to work for a time, but there is always a backlash to the games. We go deeper into the Cycle of Misunderstandings in our "Outline Series of Creativity" essays.